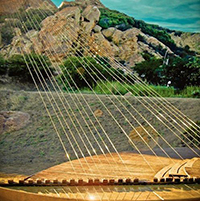 "Maya Variations for Earth Harp," a concert, will be at 8 p.m. Sunday, April 6, in Hale Library's Great Room. The event is part of the university's Creativity Illuminated celebration April 3-6. "Maya Variations" is a multimedia work that showcases Close on Earth Harp; Manoukian on Armenian woodwinds; musical composition by Ron; and video imagery by filmmaker Lebrun. The piece contrasts the ancient Mayan civilization and its connection to nature with our contemporary industrialized civilization and its reliance on technology. The performance features the strings of the Earth Harp soaring over the audience in the Great Room — known as the "Harry Potter Room" — for a special sensory experience. Tickets are required and can be purchased by calling 785-532-6428. More information on Creativity Illuminated events is available online. The April cultural calendar also is available online.